Fans of Harry Potter (i.e. people who breathe) no doubt had a love-hate relationship with Hogwarts' complicated potions master Professor Snape. Alan Rickman's brilliant portrayal in the films brilliantly captured Snape as he is in the books -- the total best and the total worst. 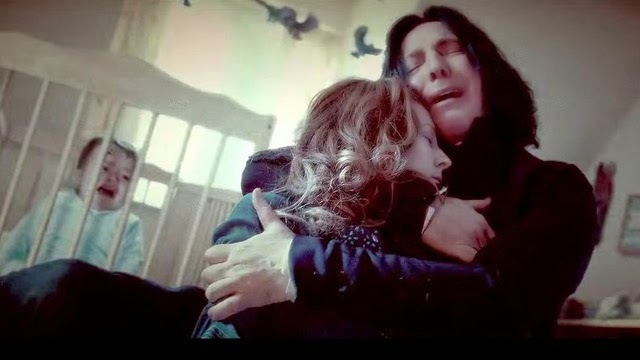 While Snape's backstory in the movies is told in disjointed order in flashbacks and revelations, a YouTube user uploaded this video of all of Snape's most important moments into one heartbreaking 14-minute gut check to your emotions. You have to watch all of it. All the big moments are in there, from Snape's feelings for Harry's mother Lily, to the moment (do we still have to say spoilers? Well, SPOILERS) he kills Dumbledore. Severus isn't the only person in Harry Potter who's hard to pin down. Tom Felton, who plays the awful, awful Draco Malfoy is a really nice dude in real life who wouldn't in a million years be sorted into the Slytherin House! Moving on from the completely sad to the completely adorable, watch the video below to see young Daniel Radcliffe in ET's first-ever set visit for Harry Potter.